My oldest daughter likes a fun shop in Forest Lake, Minesota, called the Vintage Junky. 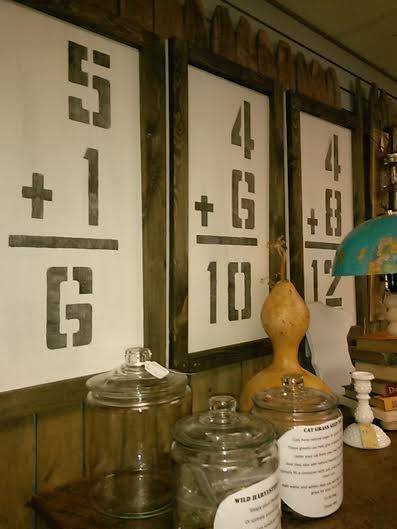 She liked these addition signs but without the frames. I hope she likes it! If not, I can sell it in my shop. I hate to admit it but my kids DO NOT follow my blog, so I am sure she will not see this! My youngest daughter wanted a scarf hanger. I was lucky enough to find a this thrift shop arched sign that was originally country blue with a scene painted on it. I base coated it in DecoArt Chalky Finish Paint in Lace as well. I then added a stenciled Fleur d'lis and black iron Hobby Lobby hooks. I distressed both of my projects with 100 grit on the edges, and 220 grit sandpaper on the stencils. Time to put the craft supplies and paint away until after Christmas! Update: The scarf hanger was a hit! I read all your posts, rarely comment but wanted to tell you that your creativity is very much appreciated. Pinned the addition sign today. Seasons best wishes. The flash cards are so fun, Carlene...I bet she'll love them! This is such a clever idea! I MUST put it on my to-do list for 2016. Pinned. I know you would say this was so easy, but I don't care if I could do it with my eyes shut, I LOVE THE FLASH CARDS! I have the same stencils, from Menards, and I want to make some of these. Merry Christmas Carlene.